The DatingAgency.com team have over ten years of experience in matching singles, and have over 2 million members currently registered on their website. This level of success speaks for itself, marking Dating Agency as a risk free choice to find likeminded singles. Just in case you need more convincing, they offer completely free sign up and browsing, and even the functionality to send an introductory message at no cost whatsoever once you find someone who takes your interest. Knowing that dating is not something you can pick up and down, and that many singles lead busy professional lives, the website is completely responsive on mobile and tablet devices, allowing you to browse and message on the go. Sign up today and get browsing! The sign up process is extremely easy in comparison to other similar dating websites of its kind. At Dating Agency, all you need is your date of birth, first name and an email address to verify your account with. You will also need to disclose whether you are male or female, and the website does not support Gay or Lesbian dating. Once signed up and verified, you will be taken to the website home screen, where you can access all the functionality of the website. The layout is clean and easy to follow, with everything accessible from the top of the screen on one navigable toolbar. There is also a footer which offers quick notifications like new messages or views for you to peruse at a glance. Dating Agency offers a wide range of features to help you meet singles near you. The search functionality automatically browses singles by location, which you can adapt to your specifications. You can also search by a number of other filters, including physical appearance, education and ethnic origin, interests, or whether their profile includes a photo or video. The addition of video profile makes this website unique against many of its competitors, and gives singles a chance to see more of their potential matches than a stationary profile. Once you’ve found someone you are interested in, send a message and wait for a reply in your inbox! Bolt on add-ins include being able to see when your messages have been read, or even allowing other users to reply or contact you for free, meaning you are not reliant on other members signing up for full membership before they can reach out to you. The website also supports instant messaging. An added flirty touch is the inclusion of winks and online gifts, as well as the simple to use ‘Encounters’ tab. This gives you a quick way to browse singles, with a quick yes or no button allowing you and likeminded singles to see if there is a mutual interest in taking things further. We love the interesting and unique ‘Diaries’ tab, giving users a place to write journal entries about their experiences, their hopes and even just their day! This is a great way to find out more about someone before reaching out, and gives you the opportunity to put virtual pen to paper and let potential matches into what makes you tick. Dating Agency has a dedicated safety section accessible from every page of the website. In it, they outline the best way to make dating online a safe and enjoyable experience. They include tips on staying safe while online, including how to best protect your identity and personal information, as well as how to recognise anyone who may have less than genuine intentions. They also have a separate list of in-person dating advice for being safe when making the move from on screen to real life. Following their advice is a great way of making sure you are keeping yourself safe, especially if you are a newcomer to the world of online dating. The website itself is protected by Online Dating Protector, which boasts 100% security as a result of 24/7 moderation, live chat functionality if there are any problems, and in depth anti scam software to protect all of its members from scammers and phishing. 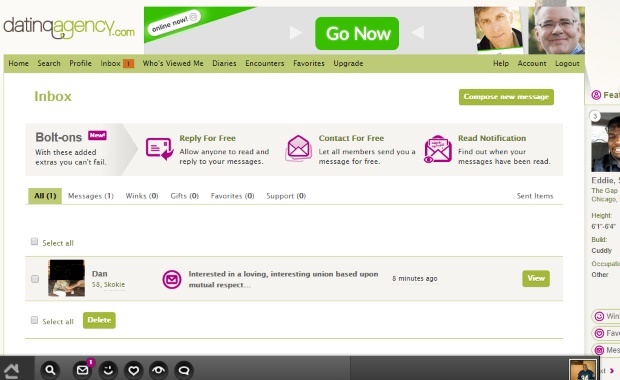 Signing up, browsing member profiles and sending an initial message to any member is completely free of charge. If you would like full access to all features of the site, reading and sending messages, sending gifts, online live chat and diary functionality, you will need to upgrade to a paid package. These are easy to understand, and work based on how long you subscribe for. The longer the commitment, the more competitive the pricing strategy. One month is the most expensive at £29.95, with 3 months reducing the price to a monthly cost of £19.99, and the most popular option of a 6 month subscription saving you almost 50% and coming in at only £15.00 per month. If you wish, you can sign up for a year for the lowest price available, £12.50 per month. Dating Agency has over 2 million members, and gives you the opportunity to get to know them on a deeper level than many other dating websites with thorough profiles and even an inbuilt blogging platform. Photos, video profiles and instant chat for a competitive price makes this website a great choice.